Monster trucks are usually projected as a form of motorized professional wrestling. Monster truck shows feature considerably more show like atmosphere than most other motor sports where competitions are usually considered a form of sports entertainment. 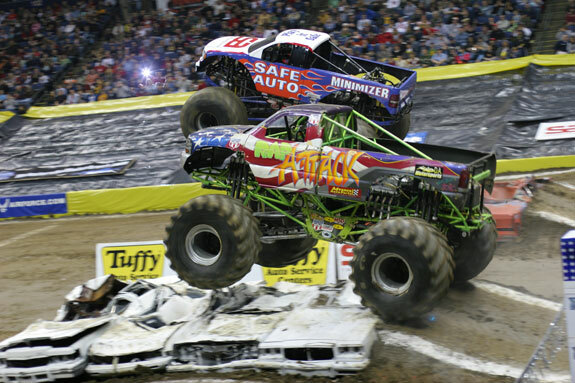 The promotion of monster truck events has also become an element of popular culture. In The Republic of Ireland, they normally use the term “Monster Trucks” to convey adventure and satisfaction. Contemporary Monster Truck is a bulky methanol fueled sandbank buggy with a fiberglass exterior designed to bear a resemblance to a pickup truck. Unlike other forms of motor sports, monster truck competitions portray heavy importance on showmanship. These trucks have names and personalities analogous to that of professional wrestlers. The first time when Monster trucks participated in standard racing was in the 1980s. These trucks used fiberglass exteriors and lighter axel to ensure enhanced mobility of the trucks. These parts functioning together make a monster truck capable to climb over obstacles in races and events where drivers stun audiences with their skill to maneuver their truck over apparently impossible obstacles. Monster trucks are highly tuned to undergo the exercise of crushing cars, jumping dirt mounds and performing various acrobatic feats with the help of huge tires. The dimension of the tires usually measures 66″ by 43″ by 25″. Safety is of supreme concern and these drivers are well equipped with numerous kill switches, as well as remote kill switch to turn of the engine for an accident that may occur. Monster truck shows are so popular around the world that numerous monster truck shows are conducted world wide throughout the year. Monster truck events can be in outdoor arena or in an indoor arena depends on the weather. During cold weather events will be indoors and on warmer weather events may be outdoors. To watch a monster truck race start is sports plus entertainment. Before the monster truck show starts an individual introduction of each trucks are done. During a monster truck rally the drivers and the pit crews show up in professional outfit, happy to meet, greet, shake hands, pose for pictures, and sign autograph after the events. These trucks emerge from the pits park in the arena track and sometimes rivals parking opposite and bumping at each other while coming to park. These rallies commence with National Anthem and drivers stand on the top or tires of the truck pose for the National Anthem. 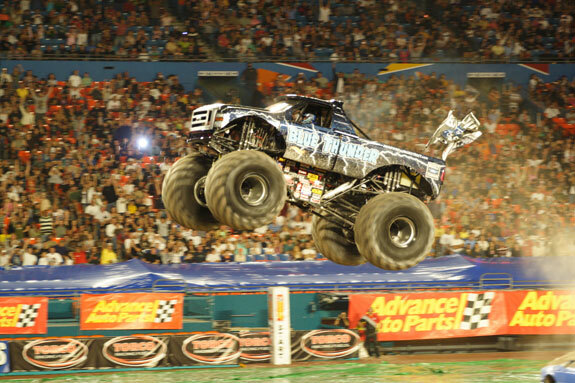 The type of Monster Truck events vary from racing to freestyle events. The race may be organized side by side in a characteristic straight line drag race fashion, with the typical count of junk cars and ramps for the drivers to deal with. The Freestyle event is a genuine crowd puller. After the racing tournament has completed, all the trucks are free to enter the Freestyle event. Each truck is given 60 seconds on the arena to impose as many random acts which may include car crushes, wheelies, high jumps, wheelies, flattening any sponsor signs or other decorations. Monster Truck events have become so popular that beyond the United States, these events are very popular in counties like Canada, Australia, Mexico, Japan, the Caribbean, South America and in many European countries as well.